A company’s brand identity and corporate culture can be expressed through office furniture finishes and colors. The finishes of our furniture designs can be customized to meld with your unique interior. Ask us about the design possibilities for your desired furniture package. StrongProject provides modern contemporary office furniture and full-service planning and strategy for companies wishing to create a stylish modern look for their commercial office spaces. We specialize in outfitting entire commercial office spaces with modern business furniture. 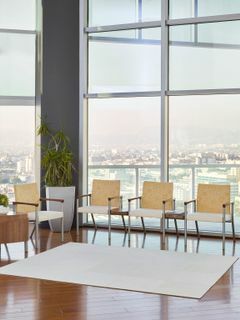 Our Showroom located in Los Angeles, CA features a collection of modern office furniture designs - from our Italian office furniture collection to our unique, modern workstations. At your disposal is our expert team of consultants to help make your business furniture planning and purchasing experience easy and affordable. We specialize in outfitting entire commercial office spaces with contemporary modern business furniture. If you are furnishing an entire office and need a quick office furniture quote, check out our Budget Your Office Tool. Want to visualize what these creative workstations and private offices will look like in different colors? Our Design Your Office Tool makes it easy to visualize many different color combinations and layout possibilities while trying to plan and purchase some of our most popular contemporary office furniture designs. Our modern office furniture will reinvent the space that defines your workday and sparks the imagination of your employees and clients. StrongProject's Los Angeles, California office is the planning hub for all our commercial business furniture projects nationwide.